As most of you know, this past week saw the almost 800 year old Cathedral of Notre Dame in Paris very badly damaged by a fire. All the major news networks covered the event and then also reported on the response of the French people and the world to the fire. People expressed shock and heartache at the what happened and immediately started pledging money to restore the Church building. Within a day, over 1 billion dollars (yes, you read correctly) was raised for the restoration. Although the French President has vowed to have the restoration completed within 5 years, most experts say it will take closer to 10 or even 15 years to complete the work. Over 13 million people visit the building every year!!! It is the most popular tourist attraction in all of France, attracting even more tourists than the Eiffel Tower. I have heard discussions on the radio as to why so much interest has been generated around the fire in Notre Dame? Perhaps the 13 million visitors each year may have something to do with that . There is no doubt that it is a beautiful and iconic structure (the finest example of French Gothic Architecture there is) that I, too, would like to see one day. It is apparently awe-inspiring to see and a moving symbol of the French nation. I understand and appreciate all of this, but I wonder whether 1 billion dollars could not be better spent in humanitarian aid or such like? And, the fact that this amount of money could be raised so quickly also speaks to how much wealth there is in the world that could be utilized for uplifting the poor and marginalized. Again, I must state that once the church building is restored it will probably be on my bucket list, but a building is not the church. And the church is not a tourist attraction, it is a living organism or body (as Paul refers to it) that is not found in buildings, but wherever Jesus’ followers (you and me) find ourselves. Of course, the gathering places of the church can be beautiful and awe-inspiring, much like our own buildings and property here at Midchurch, Randjesfontein, but the Church is not a place – it is a people. And this Easter Sunday we must remember that the resurrection of Jesus is not only an awe-inspiring historical event, it is a reality that you and I are encouraged to invite into our lives when we accept Jesus as our Lord and Saviour. We share in his resurrection life TODAY and his Holy Spirit moves us out into the world to serve and love and uplift and care for others, as Jesus did. We are called, as the Church, not to be a tourist attraction (a curios phenomenon of history), but a living, breathing, moving community of Jesus who changes the world with him. HE IS RISEN!! On Tuesday evening, I and two of our Elders, Erna Jacobs and Prince Dludla, attended the April meeting of the eGoli Presbytery Council. This time it was hosted by Linden Presbyterian Church. The meeting itself went well, but a highlight for me was when the Linden congregation was given an opportunity to share with us a little of their life and work. I was deeply encouraged! In recent years the congregation has grown and expanded their ministry, particularly their worship ministry (like us, they have three worship teams), and are doing some great work in the community in and around Linden. They also told us about how their Children’s Ministry has grown. A few years ago they had NO children in worship. Today they have about 20 and their ministry amongst teenagers has also picked up again and they now have a regular Friday youth ministry. I was also pleased to hear how closely they work with other churches in the Linden area, something we have not done well in Midrand for some years. At the meeting we also took time to pray for our members in Alexandra. We have two congregation there and we all know that the Alex community is facing serious social challenges at the moment. We committed to continue praying for them and also to assist in any practical ways that the congregations will alert us to. With this in mild, I want to ask you this coming week, especially, to pray for the churches in the Presbytery of eGoli. Give thanks for the growth and breakthroughs, but also pray for encouragement and strength in the face of poverty, violence and youth unemployment. Alexandra, BE Ngubane (Alex), Diepkloof, Dobsonville, Fourways, Moroka, Kagiso, Kensington, Linden, Mayfair, Meadowlands, Midchurch, Moletsane, Mount Faith (Krugersdorp), Orlando, Randparkridge, St Barnabas (Florida), St Columbas (Parkview), St Giles (Norwood), St James (Bedfordview), St John’s (Sandton), St John’s (Turffontein), St Magnus (Randfontein), St Mark’s (Yeoville), St Mungo’s (Bryanston), St Ninian’s (Parktown North), St Patrick’s (Diepkloof), St Paul’s (Malbarton), St Stephen’s (Rosettenville), Struben’s Valley, Trinity (Edenvale). Keryn, the children and myself spent 4 days at the beach at uMhlanga this past week. It was a very welcome and refreshing break for all of us. I am not sure what it is about the ocean breeze and the crash of the waves, but it revives my soul . Even though two of the days were overcast and a bit rainy, we did not miss the opportunity to swim everyday (at one point we were the only people in the water along the entire uMhlanga beachfront!). There are three surf lifesaving stations along the beachfront each with a set of flags near them that indicate where the safest spot is to swim on any given day in that area. Since I am no expert on the uMhlanga coastline, I needed to trust the lifesavers who spend all their time there and understand the currents and riptides etc. On Sunday the beach was very busy and a few swimmers strayed outside of the designated swimming area. No sooner had that happened that a lifeguard came out of the lifesaving stating and blew vigorously on his whistle waving at the swimmers to get out of the danger area and back into the relative safety of the designated swimming spot where we were all having as much fun as we possibly could. I was chatting with one of our members this morning about the early years of Israel’s life as a nation and how God gave all sorts of rules and regulations designed to shape their life as a nation. And that those rules and regulations were meant for their good and also to reveal to us the kind of God he is, i.e. a God of justice, love, order, holiness and provision. In fact, a God of salvation who created the nation of Israel for the express purpose of saving all the nations of the world (Gen 12:3). Since Israel (indeed all the peoples of the world) had no idea what a good, blessed, ethical, gracious and safe life looked like, God had to give them the boundaries or flags (rules) within which they could prosper and find fulfillment, but outside of which they would falter and struggle. Why? Because God knows what is good and best for us. After all, he created us. He knows where the dangers of life lie and so he warns us against going to those dangerous places and living in a way that only leads to destruction. So, whenever Israel stepped ‘out of line’, so to speak, he had to blow his ‘whistle’ and direct them back to the place that leads to abundant and blessed living. Friends, Jesus said that he came to give us life in all its fullness. This is God’s desire for you. Living within the ‘flags’ of God’s love, grace and truth is the best place to be to experience this abundant life. I invite you into that space as you open your heart to Jesus and his Holy Spirit. When the Apostle Paul wrote to the early Christian communities in various cities and towns around the Roman Empire in the first century, his purpose was not always to give instruction and teaching. Of course, since these worshipping communities were young in the faith they did need advice and guidance on how to navigate the often tricky journey of faith in a pagan society. But, amidst the many words of teaching and admonition, Paul did not shy away from encouraging and giving thanks to God for the faithfulness of the Christians. Without any presumption of being like Paul, I also want to use this letter (love note) to you as followers of Jesus in Midchurch to give thanks to God for you and, in particular, for how the Lord is using you in our worship as a congregation. Over the past year or so we have seen an amazing growth in the number of people who serve in the worship ministry. We now have 3 dedicated worship groups who lead the first part of our worship services every Sunday. Over those three groups there are no less than 21 musicians and vocalists who diligently prepare to lead us in worship. Added to that we have a growing Choir of over 30 members who faithfully minister music and song to us every Sunday. And, we are also blessed with one of the best organists in the land (I am not overstating this). As you know the book of Psalms in the bible is really the song or hymn book of the scriptures and it invites us to express ourselves feely and fully in worship to God. Not only in praise and thanks, but also in lament and confession. The Psalms encourage us to be honest and open with God as we sing new songs (Psalm 96) and make music on all sorts of instruments (Psalm 32 & 150). I want to thank God for the worship we share in at Midchurch and I want to invite anyone who plays an instrument and/or would like to sing with one of our groups or Choir, to please contact me. We will find a place for you as we all join together in praise and worship of our loving and all powerful God. The South African swear word is back again… loadshedding! No, I suspect not, but besides the periodic ecstasy that accompanies the switch on once a day, there have been unexpected ‘silver linings’ to this national crisis. As I ask around, and have experienced myself, it seems that many families are rediscovering what it is to spend quality time together… not staring at a screen, but playing board games or chatting over candle light. Last night, Keryn, I and the children sat around the dining room table and played scrabble. It was a great deal of fun (Nathan won!!) and I look forward to a few more games in the coming days. Earlier in the week I caught Nathan and Emma role playing outside and they were in stiches from laughter. If the power had been on, the chances are that they would have been doing something else… separately. In fact, they are enjoying time without technology so much, they played yesterday even when the power was on! I am not making light (pun intended) of a very serious problem! I am not trying to brush over the many difficulties and frustrations that loadshedding is causing, but I have to smile when I see what being without electricity for a few hours brings out in us – reading, talking, playing, listening. Please continue to pray about this crisis and for those trying to find a way forward. Now is not a time to moan and groan, but rather to pull together as families and friends and communities and discover our common humanity and the joy that lies with in all of us as children of God. The diverse nature of our South African society is for me a source of great wonder and celebration, but also one of deep sadness and distress. On the one hand, the variety of persons, languages, cultures, customs, traditions, styles, shapes and sizes is an expression of the richness of God’s creativity in humanity. To learn how those different to myself view the world from their perspective (upbringing, culture, gender etc.) is fascinating and humbling. On the other hand, our society (not only in South Africa, but all over the world) has a sinful tendency to use differences in those other to ourselves as an excuse to stereotype and generalize about those ‘others’, which feeds prejudices and divisions and suspicions. When this happens, diversity becomes a source of pain and mistrust and even hatred where people bully, judge and dismiss one another. “One of the hardest spiritual tasks is to live without prejudices. Sometimes we aren’t even aware how deeply rooted our prejudices are. We may think that we relate to people who are different from us in colour, religion, sexual orientation or lifestyles as equals, but in concrete circumstances our spontaneous thoughts, uncensored words and kneejerk reactions often reveal that our prejudices are still there. I told the Friday morning men’s group, Men 2 Men 4 Christ, that I was going to write about this and they just laughed and not thinking I was being serious . As we were catching up and checking in with one another this morning, one of the guys, Sigi, shared with us that two weeks ago his granddaughter had found a small rat (called a pup) in the grass near their home and brought it into the house very worried that it would die if left alone. It was very young, still without any hair and about 8cm long. What must be done with a pesky rat? Rats are a nuisance and more trouble than they are worth. Rats are pests not pets. However, the decision was taken to handrear the rat. And so, every two hours the rat was fed using a paint brush at first, and then a syringe. It grew steadily and it is now about 20cm long, covered with fur and, apparently, a very affectionate and attentive pet! Yes, you have read correctly, a rat as a pet! As the story was shared and after most of us in the group had made our witty and humorous comments, I realized that the pet rat story serves as a vivid reminder to us of the power of our preconceived ideas and prejudices. Rats have always been viewed negatively, even as far back as Leviticus 11 in which rats are declared unclean. Rats were blamed for the black plague in Europe, when it was actually the fleas on the rats, not the rats themselves. We even call pigeons the rats of the sky. Did you know that the collective noun for rats is a… mischief of rats? And yet, Sigi told us how this rat has creeped into their hearts and is becoming a very good companion and pet for his granddaughter. Firstly, we often have deep seated negative prejudices against others. Comments like, “they always do things like that…” or “don’t expect anything different from people like that…” Or “isn’t that just typical of…” Until our prejudices against rats were challenged by Sigi this morning, most of us would have perpetuated the negative feelings and thoughts around rats. Don’t allow your prejudices to you blind you to the beauty, complexity and humanity of all the ‘theys’ out in the world. Open your heart to the other, you may be surprised at how misplaced your prejudices are. Secondly, one of the reasons why the rat has become so attentive and docile and ‘loving’ is because of the care it is receiving from the hand of Sigi’s granddaughter. Most often people behave badly because they have been treated badly. But, when we start to love others and treat them with respect, you will see the power of love transforming that person’s heart. As followers of Jesus we are called to love people into their humanity as God restores their lives. Every four years all the ministers of the Uniting Presbyterian Church are invited to a Minister’s Conference that is intended to give the ministers of the Church an opportunity to fellowship in a context other than typical Church business meetings, and provide the space to engage and reflect on any number of pressing ministerial and theological issues. The 2019 conference was held this past week at the eMseni Christian Conference Centre in Benoni. The words quoted above were spoken by the Rev Sikhalo Cele, one of the guest speakers at the conference, who was invited to address the important pastoral ministry of the healing of memories. The fact is that all of us have painful memories from our pasts that often remain unresolved and leave us emotionally and spiritually scarred and even dysfunctional. We have all been acted upon by others and left wounded both by verbal and physical violence. Often those who hurt us (the axe) not only forget, but are not even aware that they have hurt us, and so they never apologize! In fact, some axe’s would contend that there is no need for an axe to apologize, because it is an axe. This leaves us, the trees, not only wounded, but also angry! And we carry with us that anger and pain all our lives, unless we allow God’s healing to restore us, as we forgive those who have hurt us. Of course, the dilemma is that the axe has long since forgotten what it has done even though the tree never does, which makes forgiving the axe so much harder. Yet, Jesus is clear about forgiving those who hurt us – Mark 11:25, Matt 18:22, Luke 6:37. Then, there is the other side of this truth… you and I are also sometimes the axe! Often, because we never want to be the tree again, we decide to become the axe. And the very hurt we once felt as the tree, we bring to bear on others as we swing at all those around us making sure that we are not hurt again. Jesus understood that the only way to be healed from the hurt as the tree, and to prevent us from becoming the axe, is to forgive those who have hurt us and allow his grace and love to dominate our lives. Of course, this may also mean standing up to the axe with the strength that God gives us. Healing from the trauma of our past memories and hurts is no simply matter, but an important step forward is understanding the analogy of the tree and the axe and what role this has played in our lives so that Jesus can help us take the further steps necessary to find wholeness and healing. I have not addressed a certain matter in our society that deeply disturbs me, because my concern is that if I should say anything, it will seem like I am simply attacking other Christians and weakening the overall witness of the Church. You will know that Jesus said a house divided cannot stand, and so I have always avoided standing in judgement of or pointing fingers at others in the broader Church because it is a bad witness to the world when Christians criticize one another. There is the far more pressing business of proclaiming the Good News of God’s Kingdom to the world, than picking fights with other believers. 1) Submission to a particular leader/s: If you are expected to accept a certain person or persons as your spiritual leader/father to whom you must, therefore, submit because they are the ones God is specifically talking to; walk away. Jesus is the only mediator between humanity and God. Yes, there are those called to lead in the Christian community, but we do not ‘swear’ allegiance to them. Jesus is the head of the church and he calls people into leadership who, together with others, discern what he requires of us. Leadership does not rest on one or two individuals. 2) Claims to have the monopoly on the Gospel: If you are told that you can only follow Jesus in that particular community of faith because they are ‘right’ and others Christians are ‘wrong’, be careful. 3) No transparency and accountability with the accounts/money: If you are refused access to the financials of a Christian community, then beware. There are no secrets in God’s Kingdom, especially when it comes to the sensitive matter of finances. 4) Spiritual and Emotional manipulation: If you feel emotionally and spiritually manipulated, walk away. Jesus NEVER manipulated anyone. 5) Classes of Christians: This is where being saved by grace through faith is not enough and being told that there are other qualifications necessary before you can know that you are a ‘true’ Christian. This is a popular one, and unless you can do or experience these certain spiritual things, then you are not really a true believer. I am not beating the drum of Midchurch here, because no Christian community is perfect. Please pray for the Church (big C) in South Africa, that we will witness with integrity, authenticity and humility. Yesterday Nathan asked me a question he often does, “Dad, do you have a meeting tomorrow night?” Again, knowing how people typically perceive that word ‘meeting’, instead of simply saying, ‘Yes’, to him, I told him exactly what the meeting or gathering was all about because I don’t want him to have a negative association with the word, realizing that some meetings are good and enjoyable and helpful . But, the issue is deeper than that and I would like to challenge you on how you perceive meetings. You see, the word ‘meeting’ has, in most circumstances, lost it original meaning. To meet someone is to encounter that person and interact with him/her on any number of matters. However, in today’s usage the word ‘meeting’ has lost that sense of an encounter with another human being and instead has become descriptive of the work done in that encounter. In other words, when going to a meeting (an encounter with other people) what is typically on my mind is not the other people, but the agenda or business at hand. The result is that I see people merely as a means to achieve the goal of that business. This will result in me either being frustrated with the other people at that ‘meeting’, or elated, depending on whether they help or hinder the work at hand. I understand the importance of being task orientated when it comes to meetings (ask folk who have been in meetings with me and they will tell you as such), however, a meeting is fundamentally, an encounter between 2 or more human beings beloved of God, for whom Jesus gave his life and who his Spirit wants to fill. This means that every meeting must primarily be exactly that, an opportunity to MEET another, whatever the business of that encounter may be. If you go into your meetings with that understanding and attitude, I suspect that the nature of those meetings, at least from the point of view of your participation, will be very different to the usual. In light of last night’s State of the Nation Address in which the President highlighted many of the problems facing our beautiful nation, not to mention the daily challenges that you and I have to overcome, the story I am going to share with you this week may seem a little mundane and even out of touch, but bear with me . On Tuesday I climbed out the shower and after drying off grabbed my can of deodorant only to discover that it was empty. I knew that Keryn and I had bought a new one the week before and so I went to the cupboard in the bedroom where we put our ‘extra’ toiletries. I looked up, but did not see any deo. I reluctantly grabbed a chair so that I could get higher up and look properly (Keryn always tells me that I don’t look properly), but still… nothing. I then thought that I may have put it in the bathroom, knowing that the other one would finish soon. I looked (carefully) in the bathroom, but… nothing. I then shouted to (not at ) Keryn asking where it could be? She suggested the same places I had, but I told her my search had been unsuccessful. She then told me to check the dressing table. I thought to myself, ‘the dressing table! ?’ I had already looked in the room and cast my eyes over the dressing table and I had not seen it, so, ‘no, I don’t think it is on the dressing table’. However, having learned over the years to trust EVERYTHING Keryn tells me, I went to the dressing table and…. there it was, in all it’s glory… my new can of deodorant. I could not believe that I had not seen it before, it was right there all along. In that moment, I knew I must share this with you because I realized that this whole scene with the deo represents our faith and relationship with Jesus so well! We often go looking for God in all the usual places; the bible, worship, prayer etc. (which is good and we must), but the problem is that we then miss him everywhere else. Unlike my deo, God IS everywhere, not only in the ‘usual’ places. He is even in the traffic with you and, yes, with the other drivers too J. Don’t only look for or expect to meet Jesus at worship and in prayer etc, but every day, everywhere and in every moment. The Lord is with you! He has been there all along. He really is, and his grace and beauty and wonder and hope is to be seen and experienced in often the most unlikely of places. Although I have not been following the blow by blow (literally) revelations of corruption that are emerging daily from the various commissions of inquiry, namely, the Zondo Judicial Commission of Inquiry into State Capture, the Nugent Commission of Inquiry into the affairs of the South African Revenue Service, the Mpati Commission of Inquiry into the Public Investment Corporation (the largest asset manager in Africa) and the Mokgoro Commission of Inquiry into the National Prosecuting Authority; I have been picking up some of the highlights, or are they lowlights, of the various commissions and this week I heard a phrase that caught my attention. One of the news reports on the radio spoke of how an official (whom I shall not name) who had, for some time, been corruptly funding his girlfriend to the tune of millions of Rands from the funds of one of the institutions mentioned above. At first the comment passed by, like so many others that are being reported every day, but then the Lord drew my mind back to the comment… ‘corruptly funding his girlfriend…”. I thought, ‘hang on a second… why are journalists using euphemisms?’ A euphemism is defined as follows: a mild or indirect word or expression substituted for one considered to be too harsh or blunt when referring to something unpleasant or embarrassing. Why are we not calling out these revelations for what they are? Corruption is a euphemism for stealing and lying! It is as simple as that. The official in question stole tax payer’s money for his girlfriend and then lied about it. Why is it reported as, ‘corruptly funding his girlfriend’? The fact of the matter is that our government and business (and society at large) is overrun by the cancer of theft and dishonesty. I pray that these commissions will help us recognize this and realize that the only way to build a society that is a blessing and benefit for all her citizens is to follow God’s values and ways of truth, integrity, transparency (our God REVEALS, not hides truth) and justice for the weak and impoverished (read Amos to get a sense of how strongly God feels about this). Friends, let’s stop dancing around the truth and instead call things for what they are so that we can weed out lies and theft, starting in our own hearts, moving into our homes and businesses and communities! Jesus calls us to bring people back into his Kingdom where ‘corruptly funding your girlfriend’ has no place. Last night I attend the induction service for the new minister at Randpark Ridge United Church (RRUC), the Rev John Gordon. The service was well attended by the congregation which made what I witnessed even more significant. Because RRUC is a united Church, i.e. originally constituted by the Methodists, Presbyterians and Congregational denominations, the service was not a typically Presbyterian service. All the essential elements were there, of course, but things were done slightly differently, better actually in one or two instances. It was a vivid and moving reminder to me that Jesus not only sends us out into the broken world with the good news of his kingdom (which we speak and hopefully do a lot here at Midchurch), he also calls us to form a community of believers in which we bring together all our sin and shame, all our pain and problems, all our love and joy…. And share it with one another. Then, the Holy Spirit does something beautiful… he shapes us into the Bride of Christ. This year I have decided to do what many of you have done before, read the bible in one year. I have set myself this goal not as some kind of task that I hope will win favour with Jesus or make me a ‘Super-Christian’, but simply because I want to immerse my life in the scriptures in an intentional way. As you can imagine, each day’s reading (from the Old Testament, New Testament, Psalms and Proverbs) brings with it fresh insights as well as reminders of old truths which the anchor my life in the Lord. One of these old truths that jumped out at me again comes from Matt 7 where Jesus speaks about a tree and its fruit. It is a simple analogy, but quite profound and very easy to apply to our own lives and to those around us. Speaking about false prophets, i.e. people who appear to be one thing, but are actually filled with deceit and falsehood, he says, “By their fruit you will recognize them. Do people pick grapes from thorn bushes, or figs from thistles? Likewise, every good tree bears good fruit, but a bad tree bears bad fruit.” Matt 7:16,17. Jesus is not calling us to stand in judgement of others, but simply pointing out a logical truth – an apple tree will bear apples, not oranges. By looking at an apple tree’s fruit, you are not judging the tree, but simply recognizing the fruit it produces. So, if an apple tree bears oranges, then you will know that it cannot be an apple tree. In the same way, our lives and the lives of those around us bear fruit. Our actions do indeed speak louder than our words and reveal the true nature of our hearts and intentions. As followers of Jesus we bear (excuse the pun ) an even great weight of responsibility because we claim to align our hearts, minds, spirits with Jesus. This is NOT about trying to be or ‘act’ perfect (because that is exactly what Jesus is speaking against here), but it is about being honest with ourselves. If our actions, more often than not, are hurtful and selfish and bullying, then we have to ask what is going on in our hearts? And be prepared to face some bad fruit and then deal with it by repenting and seeking the Holy Spirit once again, to fill us and help us bear the fruit in keeping with our profession of faith and love for God. NO ONE is perfect, we all make mistakes, but as followers of Jesus we need to be checking the kind of fruit we produce. Is it in keeping with our faith? I love you and am so looking forward to worshipping with you today. I had a bizarre experience this week. I was heading home from Ministry House on Tuesday afternoon during peak hour(s) traffic and, wanting to know how long it was going to take me, I opened the Google Maps app on my phone and touched the ‘home’ icon and it calculated that it would take 43 minutes (Yes!! This is how long it takes to cross the highway from Randjes to Noordwyk during peak traffic!!). I also have the Waze traffic app on my phone and wanted to see if it estimated the same time. I opened the app and also touched the ‘home’ icon and it calculate 46 minutes? ‘Interesting”, I thought. This would be a helpful experiment to see which app is more accurate and so I left both open. As I drove along I had 2 lovely ladies’ voices giving me directions and the difference in 3 or 4 minutes between the app’s ETA’s remained? The illustration is simple, yet profound. As you journey through life, who are you going to listen to direct your path? There may even be very well intentioned friends who will offer advice and suggestions about which way to turn, but if they guide you incorrectly, you could land up in a very different place than intended. Do you ask the Lord’s opinion when you have a major decision to make? Do you seek his counsel? He only wants what is good for you. You can trust him. My good friend, George Marchinkowski, was invited to preach at the recent centenary celebrations of Goodwood Presbyterian Church, Cape Town. The reason for the invitation was because he had been baptized into that congregation as a child and so it was a lovely moment to have him return as a minister and preach the gospel. After the worship service there were refreshments in the church hall and on display were the Baptismal Registers of the congregation spanning 100 years. George looked through them and there, in black and white, George found his name . Undeniable, documented proof that he had been baptized in the name of the Father, the Son and the Holy Spirit! When he told me the story and how he felt seeing his name there, I contacted Bellville Presbyterian Church, where I had been baptized, to ask if they could find my name in the Baptismal Register and send me a picture. 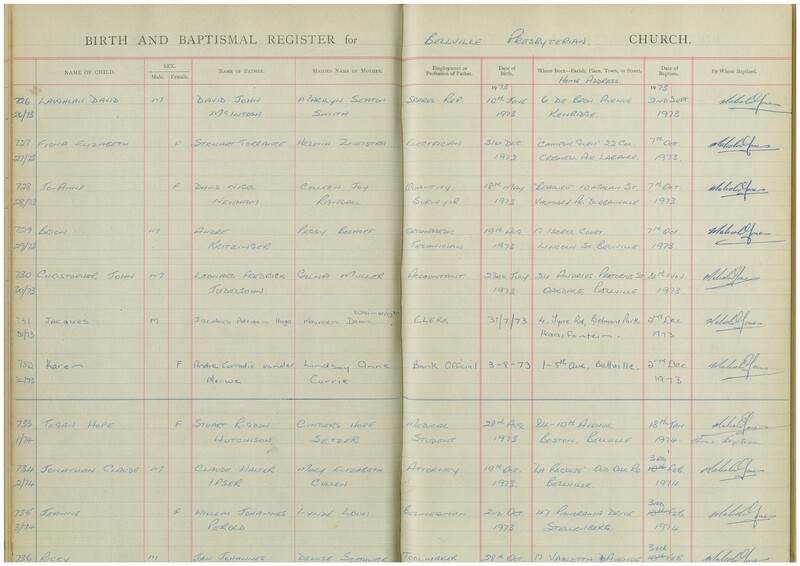 Below is a portion of that register with my name and date of baptism – 4th November 1973!! As I look on my name in that Register, I am deeply moved by the thought that I have been part of God’s family my entire life. Yes, like most of us, there have been times of wandering away, but my home and my heavenly Father has always been there with open arms to welcome me back into the family. I am aware that many congregations hold annual Reaffirmation of Baptism services where the congregation is encouraged to renew their vows of faith in Jesus and celebrate their baptism into God’s family. We will be doing something similar here at Midchurch early next year, so have look out for that . Today marks the 100th anniversary of the end of World War I. The armistice that came into effect at 11h00 on the 11th day of the 11th month of 1918 signalled the end of the world’s first global war. Between 1914 and 1918, more than 100 countries from Africa, North & South America, Asia, Australasia and Europe were embroiled in the conflict. The countries from Africa included: Algeria, Angola, Lesotho, Botswana, Kenya, Cameroon, Egypt, Guinea, Ivory Coast, Liberia, Madagascar, Morocco, Nigeria, Zambia, Zimbabwe, South Africa, Tunisia. Even countries that remained neutral felt the economic and political effects of a conflict that shattered the established global order of the day and set the world up for major social and political changes that we live with today. With regards South Africa: more than 230 000 troops fought in the war (two thirds were white soldiers and a third were black soldiers). 12 452 South Africans died during the war. In total, over 70 million military personnel participated in the war and 16 million people died (9 million soldiers and 7 million civilians). These are staggering numbers that reinforce the historical point that this was a World War. Today we will pause during worship and remember those who gave their lives in WWI (as well as all the other major conflicts since then) that have shaped the world we live in. We will also remember loved ones who have passed away (whether due to military conflict or any other reason) and celebrate that we are all part of a great communion of saints in heaven (and earth). We will give thanks for the resurrection that has broken the power of death and we will give thanks for the promise of eternal life. We will also honour all people who, like Jesus, live their lives in service of others. I was on my way to Ministry House this afternoon after an appointment with one of our members and I heard a report on the radio about the Gender-Based Violence Summit taking place today in Irene, Centurion. According to the latest report released by Statistics South Africa on gender-based violence, 70 813 women reported sexual offences in 2016/ 2017! Please take a moment to let that figure sink into your mind! And these are only cases reported. Our country, like many others (most others) around the world is plagued/diseased/broken by the scourge of the abuse of women (not to mention children and the elderly). At the heart of this abuse/violence lies the sin of patriarchy! In Genesis 3 we are told that as a result of the fall of humanity, i.e. the willful rejection of God’s ways and God’s love for us, men would dominate women (Gen 3:16). But, NOTE: This was not a blessing spoken over Adam (men) by God. It was a curse! The direct result of sin. But, men of every culture and age around the world have treated it as a divine injunction – the will of God – and so, ‘who are women to want or expect anything different?’ Most men do not treat women as God envisaged it in Gen 1:27, as an equal in the image of God. And so through the violence of words and hands, men have oppressed and dismissed and belittled and forced women to do their will. I was appalled to hear recently of a Church community known to me that have no women on the Church Council! And then they hide their sin of patriarchy behind misquoted and misunderstood passages of scripture that ‘keep women in their place’. What nonsense! Jesus died and rose again to break the power of sin and evil, and its consequences. In Jesus there is no male or female (Gal 3:28). This does not mean that there is no gender in Jesus, of course there is, men and women are different in so many ways, but with the curse of patriarchy broken, women stand side by side with men fulfilling our calling to serve and build his kingdom of love and grace…. together! So, what can you and I do? Can we pray, in Jesus’ name, against the evil of abuse and patriarchy in our land? Yes! But, we can also do something more. We can intentionally/purposefully teach our men and boys that all women are to be respected and seen as equals. No crude jokes, no shouting or beating down, no objectification (women are not property), and no belittling or patronizing or condescending, simply because one human being has different anatomy to another. For the past few years we have joined with numerous congregations in the UPCSA to mark the month of October as the Month of Mission. In particular, this has meant two things: Firstly, sharing the same themes and scripture texts for the 4 Sunday’s of the month and, secondly, participating and sharing in the daily email devotions on the theme of the month. This year we will not be joining in with the preaching themes because of our teaching series on Psalm 23, however you are encouraged to sign up for the daily devotions which are written by Ministers of the UPCSA (myself included). 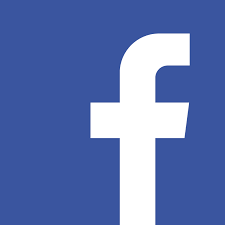 If you would like to receive the daily devotions, please subscribe by typing the following into your internet browser: http://eepurl.com/dB6tn5. Last Sunday we spent a moving and uplifting time in worship as we paused to acknowledge the many blessings and graces that God has showered over our lives. We heard 4 testimonies from members who shared how their trust in God has helped them in their recent journeys of faith and life, and we were able to bring our offerings to the Lord with a very large collection of non-perishables for the Sir Alfred Health and Elderly Care Centre in Klipfontein View (you can see some pics on Facebook in this week’s edition of The Link). Lord, I am thankful for…. Health…. Vision…. Worship…. Freedom of Faith…. An Income…. Love…. Husband…. A New Day…. Your Provision…. Girlfriend…. Church Family…. Beautiful Grandchildren…. Education…. Hands…. Another Day Sober…. Sale of House…. Neighbours…. Saving Me…. Phone…. Water…. Your Holy Spirit…. Teachers…. Sending Jesus…. Mental Health…. Our Country…. Your Love and Creation…. Good Shelter…. Music…. Healing being Experienced in our Home…. Bible Study…. New Home…. Today…. Car…. Enough Petrol…. Your Guidance in my Life…. Midchurch…. Forgiveness…. Salvation…. “Lord, I am thankful for…. a nice builder!” Can I hear an AMEN? “Lord, I am thankful for…. beating the All Blacks at Last! PS – I am very thankful to Jesus for you!! On Wednesday we held the second last Bethel Bible Study Series meeting of the year. We are all but finished reading and learning about the New Testament. As always with the Bethel Series, it has been an insightful and faith growing journey for the group. Our second last study was on the subject of Sanctification, which is the theological term used to describe the process in which our lives are changed/transformed by the Holy Spirit into the likeness of Jesus so that we can discover the fullness of life that Jesus promises to us in John 10:10. In other words, when we turn our hearts and minds towards the Lord, daily, and allow his Spirit to lead and guide us, we discover that he changes us, for the better J. Selfishness, arrogance, pride, hatred, anger etc begin to be worked out of our lives as we become more and more like Jesus. It does not happen overnight, but is a life long journey. The Bethel lesson went on to describe the marks or signs or characteristics of a life that is being sanctified. It listed 12 and they are all significant, but because of what we are sharing in worship today, the 16th of September – Thanksgiving Sunday - one of the characteristics stood out for me in particular, i.e. that the transformation the Spirit brings “broadens a sense of gratitude to God” in the believer. In other words, when we seek God and the work of his Spirit in our lives we find ourselves saying, ‘Thank you’, far more often than we did before. And, I don’t just mean the polite ‘thank you’ when someone hands us our change at a shop or serves us our meal at a restaurant, but the intentional expression of gratitude to God for the many blessings and graces in our lives. We can be quick to complain (even if it is justified), but often slow to acknowledge the gifts that God gives us every day. How about pausing for a moment…. And saying ‘Thank You’ to God for…. I like to solve problems… I think most of us do. Whether, it is a word puzzle or a DIY challenge or a broken relationship, I want to dive in and see what can be done to help. And, most often it is the simple, back to basics, strategy that works best. However, this week I missed the obvious, simple solution, convinced that the problem was quite complicated! The problem was, as we like to refer to these kinds of things in our home, a ‘first world’ problem (i.e. not a matter of life or death ). I got home on Tuesday afternoon to the disturbing news that the DSTV remote had stopped working. In fact, the children had to change channels manually on the DSTV machine!!! This was intolerable and required Dad’s problem solving skills. I jumped at the opportunity and assessed the problem. When a button on the remote was pressed, nothing happened, except occasionally the two LED lights on the remote flashed red. My conclusion was that somehow the remote had been reprogrammed and required some kind of reset. I quickly went online to Google the problem. I had a number of hits on my search and went through 3 DSTV remote guides to try and troubleshoot the problem. It seemed from my extensive reading that I had to reset the remote, i.e. to get the remote back to the original factory settings. I read how to do this and followed the instructions, but the remote was not responding as expected. I tried a number of times, to no avail. The panic was growing in the household as the prospect of a remoteless evening lay before the family. I would not be defeated and read some more. Finally, I came across a small print sentence at the bottom of one of the pages that suggested that the batteries may need replacing! I thought that it could not be so simple, because the problem was clearly a complex one. I scratched around and found two AA batteries, inserted them and, like a miracle, it began working like normal again!! Praise the Lord. - Love God: place him at the center of your life, plans and decisions. Pray, worship and seek his guidance. - Love others: Show respect and kindness and serve the needs of those around you. - Love yourself: Make sure you eat a healthy diet, rest, exercise and laugh a lot. Do you perhaps need to get back to these simple basics in your life? Give it a go, you may be surprised. I share this with you in no way to boast, but simply to illustrate the subtlety of temptation and the power of God to overcome it. We had two cashiers helping us. It seemed like the gentleman was a trainee, although he did not have a trainee badge on, because the lady assisting him kept checking what he was doing. I suspect that this interference from his assistant caused him to be a little flustered because by the time he took the last item of clothing to remove the security tag, scan it, fold it and then place it into the carrier bag, he forgot the step of scanning it. I noticed that he had not scanned it and as he placed it into the bag and told us the total cost (which excluded the last item) the thought crossed my mind that all I need to do to get a free item of clothing was…. say nothing! A nudge from the Lord and I knew that I could not remain silent and so I politely told him that he had not scanned the final item. He responded by telling him, quite confidently, that he had. In that moment the thought in my mind was, “Wow! A second chance to get away with not paying for the one item. It won’t have any real impact on Woolies. Perhaps I should just go with it?” But, again, the Spirit’s nudge, and I insisted that he had missed the item. He (and his assistant J) checked and realized that he had missed the final item. He thanked me sincerely and I paid. I walked away pleased that I had not succumbed to the temptation and held my ground, so to speak. I have no doubt that it was the work of the Spirit in me and is to his glory. But, how easy it would have been to have said nothing walked away and in so doing having broken two of the 10 commandments – DO NOT LIE and DO NOT STEAL! Two things struck me about this experience. Firstly, that God’s instructions and values are given to us for our benefit, i.e. when we follow them the result is a society/community/world in which life is lived fully and in respect of God and others, because that is the intention of his instructions – to bless us. Secondly, that silence is not an option when we are faced with injustice and wrongdoing. By remaining silent we perpetuate an unjust society. We must speak up, even if remaining silent seems like the easier option.